The Australian government last month released the final version of its long-awaited Energy White Paper. Energy Minister Martin Ferguson’s speech to the Committee for Economic Development of Australia (CEDA) launching the White Paper was interrupted by Quit Coal protesters, one playing a fictional mining magnate thanking Ferguson for supporting the coal industry. After the protesters were removed from the stage, the audience (evidently a bunch of dinosaurs) applauded Ferguson’s retort that the demonstration said something about the education of young people and he would resume discussing “how we create wealth to create economic opportunities for those young people”. Let’s look at how the government intends to do this. The Energy White Paper is a dry document, in more than one sense of the word. Once again I am struck by the contrast between the way the Labor government is portrayed by the likes of News Corporation, and the government’s true policies and priorities. On the surface, the final White Paper somewhat improves on the draft version (and on the dogmatic anti-renewables stance Labor took in Multi-Party Climate Change Committee negotiations) by acknowledging the falling prices and growing role of renewables and proposing demand-management measures. This is possibly thanks to the increasing clout of the renewable energy lobby. It’s certainly an improvement on the Howard government’s 2004 Energy White Paper, which placed all of its climate eggs in the CCS basket (mainly through a $500 million Low Emissions Technology Demonstration Program which has been perpetually delayed). But instead of advocating further action as is urgently needed, the White Paper merely reaffirms inadequate existing climate policies, claiming “the Australian Government has already put in place the key mechanisms to drive a transformation to cleaner energy”. The big picture is that the government’s fossil fuel addiction remains as strong as ever. The Energy White Paper’s key priorities include “developing Australia’s critical energy resources, particularly gas resources” (p xviii). It plans to facilitate the expansion of fossil fuel mining and export industries at a time when they should be phased out as fast as possible. It boldly says (p. 66): “Coal is, and will remain an integral part of Australia’s economy.” Gas and coal rate far more mentions in the White Paper than any renewable energy technology. In a nutshell, the shift from Howard’s Energy White Paper to Gillard’s one is from a fossil-fuel-only approach to an all-of-the-above policy analogous to Obama’s, which seems to have originated from a spoof campaign video by Paris Hilton, of all people. The Energy White Paper advocates at least as much investment by 2050 in coal, gas, and the unproven technology of CCS ($95-125b) as in renewable energy technologies that are available now ($100b). However, the government has delegated responsibility for these investment decisions to the market. This gives an unfair advantage to fossil-fuelled electricity generation, which is profitable today thanks to past government ownership and $13 billion in present federal subsidies (which the White Paper dismisses as routine). 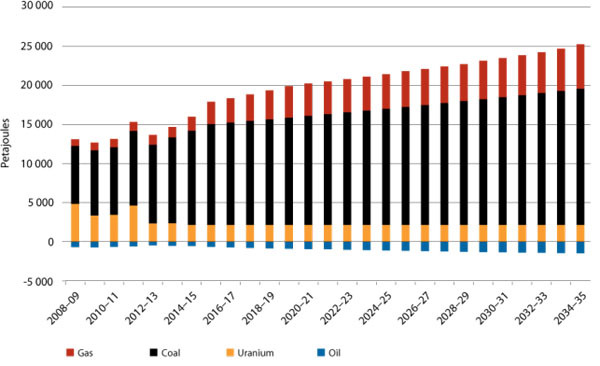 The government envisions fossil fuels will still meet 60% of Australia’s electricity in 2035 (compared to 90% today), after which in the words of environmental lawyer Chris McGrath, “the tooth fairy appears”. 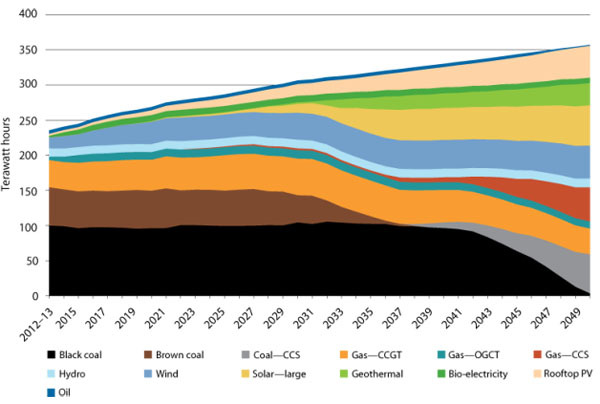 McGrath was referring to the White Paper’s assumption that the government’s literal pipe dream of carbon capture and storage (CCS) miraculously becomes feasible so the fossil fuel industry can continue to supply 44% of Australia’s electricity in 2050. CCS is perpetually decades from being commercial; it is in the fossil fuel industry’s interests to hold out the promise of CCS, but not to actually deploy it because it could double the cost of generating electricity. The White Paper does not include a graph of emissions projections, but the draft version cited Treasury projections showing Australia would meet its (inadequate) targets by purchasing cheap and dodgy offsets from overseas. Domestic emissions would actually rise until the 2030s then fall back to today’s level by 2050. In any case, the largest source of demand for Australian fossil fuels remains unimpeded: our climate policies do not apply to emissions from fossil fuels burned after they leave our borders. Any emissions cuts at home will be far outweighed by the Energy White Paper’s planned exponential growth of fossil fuel exports. The White Paper boasts Australia is the world’s largest coal exporter and intends we will soon be the largest exporter of liquid natural gas (LNG). It enthusiastically projects Australia’s coal exports will double and our gas exports quintuple by 2035 (and as I’ve written before, the total capacity of proposed coal export ports suggests the reality could be even worse). The excuses for fossil fuel exports don’t stand up to scrutiny: our exports are our responsibility. Not only does the government want Australia’s enormous known fossil fuel reserves to be burned, it also plans to go exploring for new ones. It has requested a Productivity Commission inquiry to “determine whether there is evidence of unnecessary regulatory burden” on energy resource exploration (p. 79). It supports opening up whole new industries in unconventional gas and unconventional oil, which are even more carbon-intensive than conventional fossil fuels. It even briefly mentions protecting fossil fuel infrastructure from climate change impacts. The Energy White Paper speaks of “a need for industry to engage with local communities and other stakeholders to earn a ‘social licence to operate’” (pp. xvi-xvii). It supports existing weak regulations as ways to address voters’ concerns about the development of fossil fuel industries without actually hurting the industries – though it seeks to weaken those regulations. It also mentions working through the Council of Australian Governments (COAG) on “reducing regulatory burdens”, “rationalising carbon reduction and energy efficiency schemes”, “streamlining environmental regulations”, and promoting “coexistence” of coal mining and gas fracking with agriculture. Similarly, Ferguson said in his launch speech: “we simply cannot afford to miss opportunities through a lack of understanding or a failure to retain a social licence to operate” and called on the “energy industry” to “step up its engagement with the community, because without their support your business will face increasing challenges.” Despite claiming to be technology-neutral, something tells me he wasn’t talking to the solar industry. Ferguson also said implementing the White Paper will require “overcoming populism” – perhaps referring to anti-fossil-fuel groups like Quit Coal? He can’t have been referring to renewable energy because the overwhelming majority of Australians support it. If you require further evidence of where the government’s loyalties lie, consider that the Energy White Paper was praised by mining industry groups including the Australian Coal Association. The only realistic solution to climate change is to phase out fossil fuels. Australia desperately needs an energy policy that will do so, not one based on the delusion that we can afford to burn it all. As Beyond Zero Emissions has argued, Australia’s leadership in the wrong direction gives us power to lead in the right direction: by rapidly eliminating all greenhouse gas emissions from our domestic economy, phasing out our fossil fuel exports, and launching international negotiations on a global fossil fuel phaseout. But I suppose Martin Ferguson would say the International Energy Agency is suffering from a “lack of understanding” of the fossil fuel industry. Ferguson knows better: catastrophic levels of global warming will “create economic opportunities”. After all, he doesn’t take advice from silly uneducated protest groups like the IEA. He gets his policies from hardheaded mandarins – like Paris Hilton.